Manuel Martins and others fill up at Cumberland Farms gas station in Somerville, Massachusetts. Low gas prices are pumping up Americans’ wallets, giving them more money to spend on other goods and services and helping them save more of their paychecks. Americans spent less on gasoline in January than in any month since 2009, according to data released by the Bureau of Economic Analysis on Monday. That left them with billions of dollars more to spend on everything from restaurants to electronics. In total, Americans spent 0.2 percent less in January than in December, before adjusting for inflation. Ordinarily, that would be bad news for the economy, which depends heavily on consumer spending. 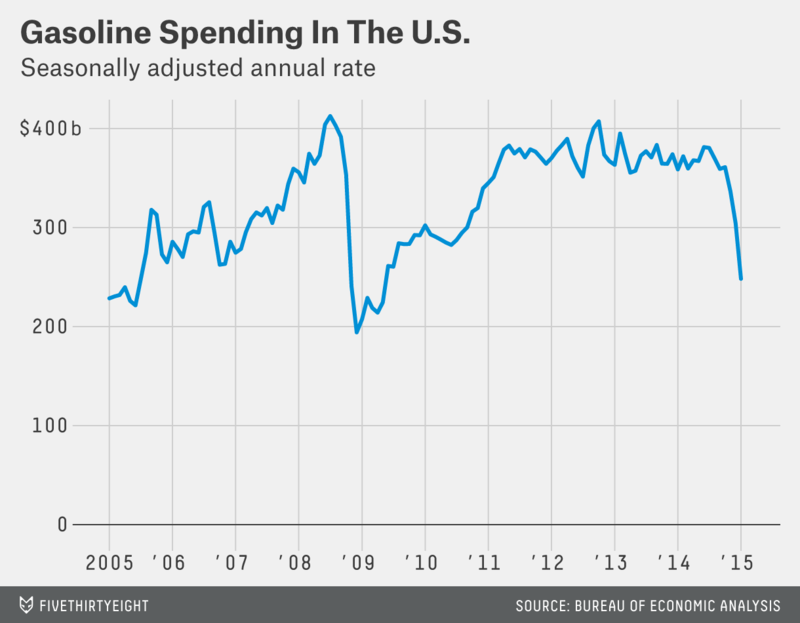 But in this case, the slowdown was more than explained by an 18 percent drop in spending at the pump; set that aside, and spending would have risen 0.3 percent. That rise was partly because of higher utilities spending in response to the cold weather. But it also reflected higher spending in discretionary categories such as restaurants, hotels and recreational spending, which suggests that consumers are spreading their gas savings across the economy. Moreover, consumers were able to boost their spending while saving more. Americans saved 5.5 percent of their after-tax income in January, the highest rate in more than two years. Low gas prices weren’t the only factor helping consumers. Incomes rose too, with most of the gain coming from private-sector wages and salaries. That should provide the economy with a more lasting boost. Gas prices, after all, are unpredictable and have already begun to tick back up.